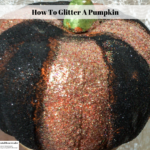 Have you ever wondered how to glitter a pumpkin at home? There are links below to products I recommend from companies I have an affiliate relationship with. I will be compensated if you make a purchase after clicking on my link. It is a lot cheaper than buying ones that already have glitter on them plus you can easily customize the design and colors to fit the rest of your holiday decor. Pumpkins are a staple of fall decorating – from harvest through Halloween and even Thanksgiving, they fit into almost any type of decor. Faux pumpkins come in multiple sizes and price ranges. Look at hobby stores and if they are not discounted, use a coupon or for smaller pumpkins look at the dollar stores. For this project I chose a foam pumpkin that cost $1.00. I already had glue and glitter at home. I did purchase the stand seperately for under $10.00. It’s up to you if you wish to display your pumpkin the way I did or if you wish to just sit it on a tabletop. I intentionally let some of the orange of the pumpkin show through the glitter to make it look old. Here is how I glitter a pumpkin. Use a paintbrush to brush to cover one section of ribbing with a thin layer of glue*. Hold the pumpkin, glue side facing up, over the top of a piece of paper and sprinkle the area covered in glue with a single color of glitter. Tilt the pumpkin sideways to allow any excess glitter to fall off onto the piece of paper. Give the pumpkin a slight tap on the bottom to release any loose glitter. Skip two ribs and repeat the process using the same color of glitter. Do this until every other section of pumpkin ribs is covered in glitter. Set the pumpkin aside on a piece of clean paper to dry. Fold the paper and pour the glitter back into the bottle it came out of. Once the first sections of glitter are dry, brush a thin layer of glue onto one of the remaining orange sections. Pour a second color of glitter onto the fresh glue. 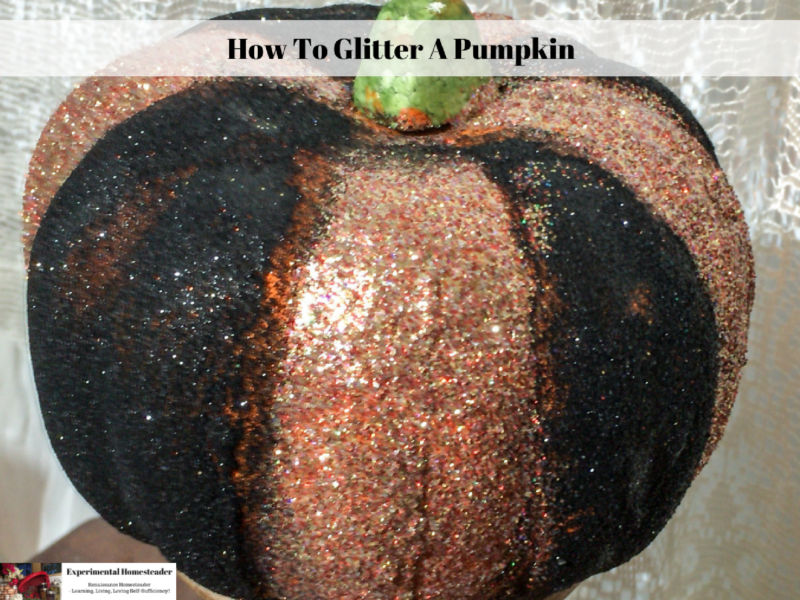 Tilt the pumpkin straight down – do not let any of the second color of glitter get onto the glittered areas. Give the pumpkin a slight tap on the bottom to help release any loose glitter. Move onto the next section that has no glitter on it and repeat the process. Once the entire pumpkin is covered in glitter, set it aside to dry overnight. The next day look carefully at the pumpkin. If there are areas that need more glitter on them carefully add glue using the paint brush and then dust some glitter on using the same process as above. Allow the pumpkin to dry for another 24 hours. Repeat this process until you are satisfied with the way the pumpkin looks. Once you are happy with the results, use a clear spray sealant to seal the glitter and keep it from flaking off. Allow the sealant to dry according to the manufactures instructions. Repeat the sealing process three times making sure the sealant is completely dry before adding another coat. Once the final coat of sealant is dry your pumpkin is ready to display. Be sure to wrap it in bubble wrap or newspaper at the end of the season and store it away so you can use it again. *Note: Choose how large of an area you wish to cover with one color of glitter. I choose to cover 2 ribs of the pumpkin with one color, skip 2 ribs and repeat until I completed the entire pumpkin. It is best to work a section at a time to prevent the glitter colors from mixing.